Preparing For Swim Camps in DR | Mediterra - Swim & Run Better Than Ever! We hold our camp in Las Terrenas – in the northeastern province of Semana. It takes only 2 hours to travel from Santo Domingo to Las Terrenas on a wide, nicely paved highway. Las Terrenas is a small seaside town with several picturesque beaches and mountainous tropical landscape. The swimming in this area is protected by reefs a few hundred meters from shore. It is likely that we will set up a group transfer from Santo Domingo to Las Terrenas and back. It would depart on the morning our camp starts, and return on the final day of camp. This transfer option would likely require you to arrive in Santo Domingo a day early and plan on departing a day after the camp dates. First of all, we are pleasantly surprised at how many people speak English and are friendly and eager to help. You may do fine trying to make your way to Las Terrenas without knowing Spanish. You may rent a car from any of the major auto rental companies at the airport. 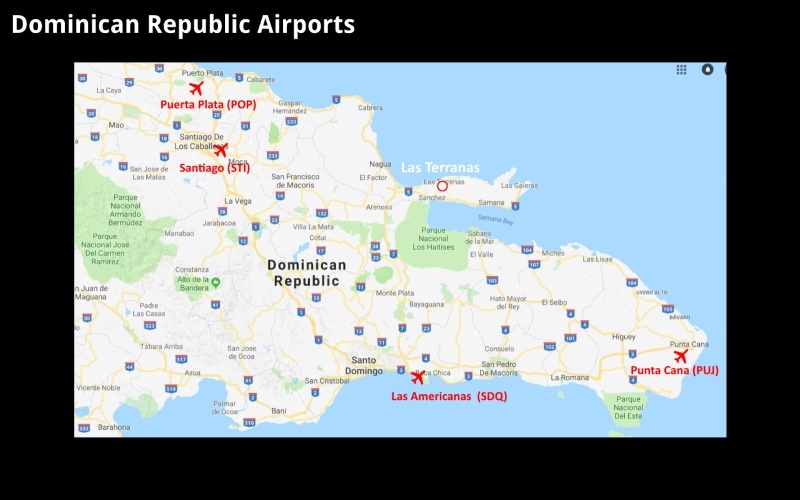 There are several private transfer companies listed when searching Google for ‘private airport transfers Santo Domingo’. such as Sun Transfers that you may take to Las Terrenas from the airport or from a hotel in Santo Domingo. It may be possible to arrange an Uber ride to Las Terrenas. What kind of critters will we see? The island is surrounded by the Atlantic and the Caribbean Sea. All different kinds of sea creatures call this home. We are entering their space. Yet, our local contacts – surfers, fishermen, swimmers – say that they have rarely seen a jellyfish and have not seen sharks in the areas we would be swimming. We have experienced some stings from stringy hair-like things that may have come from a jellyfish being eaten by a turtle. The sting is slightly unpleasant, and it goes away in 10 minutes. The coral and rock formations underwater are VERY SHARP and shallow. We need to be cautious swimming around and over these. There are spiky sea urchins tucked in the cracks all over. We don’t want to touch those either. There are sea turtles in this region, though we don’t know how likely it is for them to enter the shallow reef zones where we will be swimming. There is some tidal action each day, and there can be some prevailing or wind-driven currents, but not so strong that we can’t enjoy swimming against them in our swimming areas. Really, the most common danger we face is the sun and the sharp rocks. Have some strict or unusual dietary needs? Please let us know so we can let you know what to expect of the local restaurants and markets. Vegetarians will find many solutions. A staple meal is white rice and beans, and fried or boiled plantain which tastes just like potato. Vegans will find it a bit more challenging as we suspect many of the sauces or flavoring even in vegetable dishes may use meat bullion. Gluten-intolerant folks can get by OK, especially if you like beef, pork and chicken. There are tons of fresh fruits and vegetables to fill up on. Occasionally, we have a guest with some very unusual restrictions – for this we will do our best to help you, but please come prepared to be creative and bring along extra supplies (or purchase from the market here) for yourself as needed. You are certainly welcome to explain your particular situation further. we can work together to come up with a plan to get you through the week comfortably. You may view the current exchange rate for Dominican Pesos on the XE.com site. What might you need money for? Your room, and breakfast are covered in your camp fee already. You will have some extra expenses for lunch and dinner, beverages, and snacks as you please. You may expect to pay approximately USA grocery prices for common items in the supermarket, or a bit less. You may hire a car or motorcycle taxi occasionally to get around town. This may be just $1 or $2 a ride. If you like, you may tip the transfer driver – $10 (for a group) would be a nice gesture. But don’t feel obligated to. You may exchange your home currency for Dominican Pesos in the national banks, on weekdays. If you want to withdraw cash there are a many ATM machines scattered around town. They only dispense Dominican Pesos. If you intend to use your card, be sure to contact your bank to let them know you will use your card in Dominican Republic. The main restaurants and markets will accept your credit card, but cash is the easiest with all the road-side vendors, small markets, and small restaurants. Will my mobile phone work in DR? Once your phone signal is detected by the local carrier it should connect. However, we cannot tell you anything about what rates you will be charged! So, please check on what your home carrier rates will be and consider purchasing a temporary international calling plan. Signal should be strong at our lodging and at our training locations. But during our boat excursion, it is possible we may park or travel through a zone where cell reception does not work so well. It is also possible to buy a pre-paid SIM card to use the national cell service and get more affordable data connection. Our official START time will be 16:00 at the hotel on the first day. We will make our greetings and introductions, and pass out camp materials. We will go for a first warm-up swim (or ‘cool-down swim’ if you prefer) after the introductions. Our official END time will be 12:00 on the final day. We will have a final swim/training session that morning. Because of variation in everyone’s departure times, we may give our official congratulations and certificates the night before. Our guests may come from any corner of the world. We understand the challenges of finding suitable flights. It is OK with us to arrive a little late or leave a little early if necessary (though we cannot offer discounts on the fees for this). Please see the camp specific page for information about the schedule. Will there be wifi at our lodging? But we cannot tell you how strong the signal will be in all locations of the property. There are boosters set up in strategic locations and we have the impression that it reaches all the apartments. Do you have your tourist visa for DR yet? Apparently, as of April 2018, foreign guests arriving by flights to DR no longer need to purchase a tourist visa before or upon arrival at the airport. The tourist visa fee will be included in the purchase of the ticket, taken care of by the airlines. You may view this news article to confirm. There are still a few exceptions for foreign guests from certain countries. You may view this list to see which countries. If you do need to get one you can apply for it online HERE. It costs $10 USD and is valid for 30 days. You will print out your visa and present this paper with your passport when you go to passport control after arriving at the first Dominican airport. Most touristic flights may arrive at Santo Domingo (SDQ), Santiago de los Caballeros (STI), or Punta Cana (PUJ). In Santo Domingo, the airport is called Las Americanas and it located on the far east side of the city, on a small peninsula by the sea. It takes about 25 minutes to travel from the airport to downtown, if there is light traffic. It is possible to arrive at Punta Cana or Santiago and rent a car. Might need some laundry done? We have a nice relationship with the staff at our villas property and they are willing to run a load for you for a small fee. It is possible that one of the apartments used by our group may have a washing machine also. What if I need some medical attention? First, we are going to send you an interview form to collect Emergency Contact information and notes on your current medical needs and condition. We will keep this information secure and delete if directly after camp. But in the case of an emergency everyone will be glad we have it. Please bring any critical medications you need, but also have us help you check for backup solutions in case you need one locally. Second, we take great care with our guests and as a group to make plans and actions that keep us as safe as possible. We will do our best to protect ourselves with what we can control. We will have our own well-stocked first aid kit. At least a couple of our staff are Red Cross lifeguard and first aid certified. In the event we have an accident that requires medical attention, our staff will carry out our emergency action plans to care for each person. There is a local clinic in the town of Las Terrenas. But frankly, it may not offer you the kind of care you would expect. There are well stocked modern pharmacies in town. There is national medical emergency helicopter service in DR. The full-service, public and private hospitals are located in Santo Domingo. 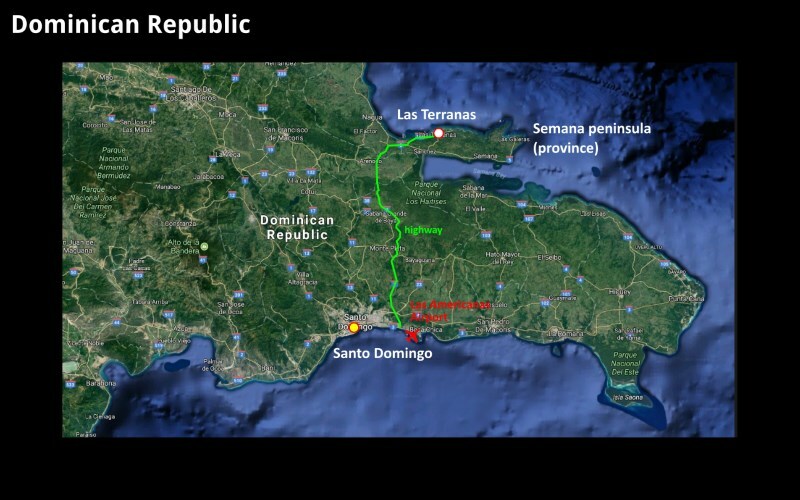 It is a 2 hours drive to the capital from Las Terrenas. You may view the US Center For Disease Control Health Information for Travelers to Dominican Republic for guidance on what vaccinations to consider.